News earlier this week that former Afghan president Burhanuddin Rabbani was assassinated by a Taliban suicide bomber prompted reactions ranging from shock and grief to resolution and determination. Rabbani was killed by a suicide bomber in his home, the bomber having hidden the explosives in his turban.Rabbani had been a major adviser to the Karzai regime, and had been involved in the purported peace negotiations with the Taliban leadership. The media reactions to his killing emphasized his role as a peacemaker, a wise political leader and man of vision. 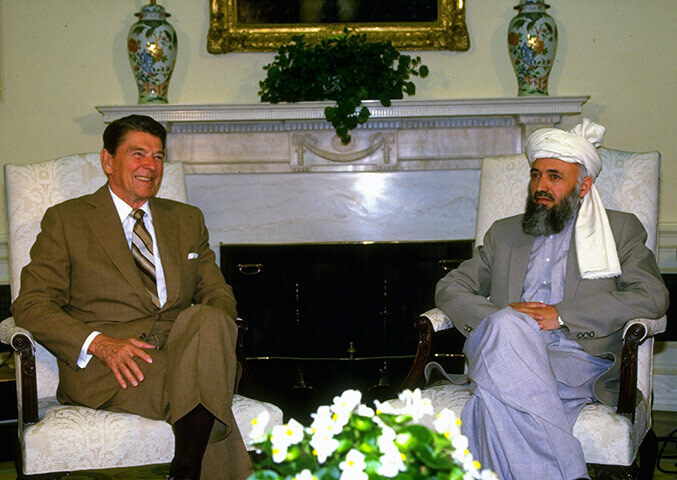 However, we would do well to remember that Burhanuddin Rabbani was the political leader throughout the 1980s of the CIA-supported mujahideen militias that fought the socialist government and Soviet troops in Afghanistan. Rabbani represented the mullahs that wished to stop education for young girls, force women out of paid employment and return them to the home, impose a rigid ideological orthodoxy that tolerated no opposition, that sanctioned the murder and torture of secular-minded and socialist people, and restoring the privileges and wealth of the landlord class that had been ousted by the communist government. The socialist government had cancelled the debts of the poorest peasants, and established cheap, low-interest rate loans for agricultural workers which undercut the usurious practices of the richest landlords. All these measures were reversed by Rabbani when the latter came to power in 1992. Rabbani was the first political leader into Kabul in 1992 after the Afghan socialist government abandoned power. The mujahideen militias then turned their guns on each other from 1992 until 1996 when they were driven out by the Taliban. During that time, women were forcibly velied, the archaeological treasures of Afghanistan were looted, the educational institutions deteriorated, medical and health systems collapsed and there was a mass exodus of refugees from Kabul and the major cities that had been relatively untouched through the 1980s Soviet period. Rabbani was a fanatical psychopath responsible for the deaths of tens of thousands of Afghans and the reversal of a relatively liberalised, secular society. His murder was portrayed in the media as a blow to the peace process; however, the reality much more complex. As Stephen Grey of the Guardian newspaper points out, the vaunted peace process is actually more about lulling the Taliban into relaxing their guard, bribing their commanders to change sides, and generally stall for time as US and British forces continue hitting the Afghan population with night-time raids, unmanned drone strikes and carrying out this war of attrition against Taliban militants. Make no mistake, the Taliban are hurting; they are losing people, but they are responding with high-profile attacks and assassinations, the latest being the killing of Rabbani. The US and British forces in Afghanistan seem to have only one tactic for defeating the Taliban – encouraging defections through bribery. The Taliban are most definitely a bunch of crazed, fanatical killers – there is no doubt about that. The suicide bombing of Rabbani is only the latest terrorist outrage carried out by the Taliban foot-soldiers. But sympathy for Rabbani is tempered when remembering the role he played in leading Afghanistan into its current deplorable situation. As we reach the tenth-anniversary of the current Afghan war, there is no end in sight to that conflict. The Obama administration has basically escalated that war, deepening America’s quagmire resulting in more deaths and new levels of violence. The Afghan war has nothing to do with liberating its people, but rather imposing US designs for military and economic dominance in the region. Near where I live in Sydney, there is a war memorial commemorating all those people from the area that died serving the Australian armed forces in wars overseas. There are columns for each war Australians have participated in, followed by the names of those that never returned. For instance, there are columns for World War One (1914-1918), World War Two (1939-1945), the Korean War (1950-53), and also the International Campaign against Terrorism (2001 – ). You notice that last one? Unlike the others, the war on terror has no end date. The horrific terrorist attacks of September 11 prompted justified outrage at the perpetrators and sympathy for their victims. Since then, there has been a continuous barrage of war crimes, an escalation of US wars in the Middle East, new offensives against Iraq and Afghanistan by the US imperial power, and a steady erosion of democratic civil liberties in the name of a ‘war on terror.’ In fact, the first decade of the 2000s can rightly be called the savage decade. The Bush/Cheney administration seized upon September 11 as an opportunity to implement imperial designs that long predate the actual terrorist attacks. As Anthony Arnove documents, senior national security staff were directed by Condoleezza Rice, Bush’s national security adviser and later secretary of state, to capitalise on the opportunities for the US to reshape the world, implement regime change, and redesign significant portions of the globe for US imperial interests. The September 11 tragedy has become a blank cheque, a banner under which US war planners have justified their imperial interventions to a sceptical public. The US has been carrying out war crimes in the name of September 11. It is a terrible, perverse usage of the tragedy to whip up public sentiment to commission crimes that have more in common with the doctrine motivating the perpetrators of September 11. As Robert Jensen, journalism professor at the University of Texas points out, there was no doubt that the Bush/Cheney administration was going to use 9/11 as an excuse to launch all-out wars in the Middle East and Central Asia. There was no illusion that the Bush/Cheney cabal were fanatical imperialists and racists, dedicated on demonstrating to the world that the US empire was on the war path. What is now becoming apparent is that the Obama administration is following practically the same course, although with a different disguise. Wait a minute, didn’t Obama declare an end to the war on terror in 2009? In a way, yes – he rebranded it as ‘overseas contingency operations.‘ A different name for exactly the same package – that’s rebranding you see. Here in Australia, we are told that the world changed on September 11. Did it really? Yes and no. As Ismael Hossein-Zadeh, economics lecturer at Drake University says, certainly the 9/11 tragedy prompted calls for regime change, imperial retribution and preemptive strikes by the United States. The rendition program where torture is ‘outsourced’ to third countries under the supervision of CIA and MI6 officials, the imprisonment of terrorism suspects without charge or trial, the Patriot Act, Homeland Security provisions – these are all developments post 9/11. But the military-industrial-financial complex had plans for regime change, the economic outreach into more countries and extension of US military power years before 9/11, since the fall of the Berlin Wall back in 1989. With the dissolution of the Soviet bloc, a significant restraint on US militarism was removed. Zbigniew Brzezinski, the national security adviser under former President Jimmy Carter and main architect of the US-sponsored Islamic Mujahideen war against the Soviets in Afghanistan, wrote in a 1997 book about the need for the US to confront Russia, China, India and others to remain the dominant economic and military power in Central Asia and the Middle East. US war planners needed new enemies, and they came up with many – the clash of civilisations, rogue states, militant Islamism and so on. But 9/11 was the new mantra, and the beneficiaries of the giant military budget and security spending fixed onto a new ideological banner to disguise the agenda of imperial expansion. It is this broader context in which the US wars in Iraq, Afghanistan (and now Libya) must be understood. The National Priorities Project is an organisation dedicated to explaining, in terms as clear as possible, how the US federal budget is composed and how tax dollars are spent. They recently put together a report regarding the amount of money spent on national security since September 11, 2001. Since that day, the US ruling class has spent 8 trillion dollars on homeland security, the Pentagon’s military budget, the Iraq and Afghanistan wars, and all the associated spending on the US State Department and federal agencies. All this spending was supposedly prompted by nineteen hijackers armed with nothing more than box cutters? I think that Sheldon Richman is right – national security spending is a scam. As he points out in his article, opportunistic and cynical politicians have been using 9/11 to frighten people into accepting even more military spending. Is the world actually safer because of the war on terror and all this military and national security spending? Well, according to the numerous security pundits, the world is safer because countless terrorist plots have been foiled, but they just cannot elaborate because of national security. It is the old ploy – “we could tell you, but if we did we would have to kill you” trick. Without adequate information it is hard to say, but I can make two observations. Firstly the war on terror has failed to thwart attacks on the European and Western countries. Secondly and even more importantly, the war on terror and the associated extraordinary renditions, torture and repression breeds resentments across the Islamic and Middle Eastern countries. When US forces and unmanned drones kill scores of civilians across Afghanistan, Somalia, Pakistan, Iraq and other countries, don’t you think that some Muslim people will develop anti-American resentments and hatreds? The descent of the American military and political system into thoroughly detestable forms of behaviour – barbaric torture at Guantanamo and Bagram air base, the killing of civilians in Iraq and Afghanistan, the packs of unmanned Predator drones – all this behaviour leads to a massive buildup of discontent and sows the seeds for future terrorist attacks. While the 9/11 fanatics were driven by a complex array of religious and political motives, there is no doubt that continued American support for Zionism, and the Arab dictators around the Middle East, was a major factor in their hatred of US imperial power. With the homicidal overreaction by the US empire, the terrorists kind of got what they wanted – an extension of American imperial criminality into costly and savage wars that are draining the US of its resources. The Afghanistan war is coming onto ten years, and thousands of American troops remain in that country. There is the ongoing occupation and insurgency in Iraq, and that conflict shows no signs of ending, even after Obama’s rebranding of that occupation and fake withdrawal of troops. Not long after the September 11 attacks, former President Bush issued a new doctrine, a new national security strategy of ‘preemptive war’ to strike at terrorist groups and states that allegedly pose a threat, or are developing a credible threat, to the United States. This doctrine, continued by Obama, is basically a license to wage aggressive war. Was not this kind of behaviour outlawed and condemned by the Nuremberg trials at the end of World War Two? Obama explicitly endorsed the doctrine of preemptive war, ironically when giving a speech accepting the 2009 Nobel Peace Prize. I have to agree with Tom Engelhardt – when it comes to September 11, let’s cancel it. Let’s stop the commemorations, the gatherings of pompous politicians, the hoopla, the new towers, the waterfalls – let’s stop the lot. What is more important is stopping the abuse of the 9/11 horrific attacks to perpetrate even more terrorist crimes and imperial wars, while enveloping those wars with hypocritical reverential remembrance. Stop using the supposedly ‘hallowed’ ground zero to promote carnage and barbarism overseas. The 9/11 killings, while appalling and ghastly, are not a license for continuous war and descent into harrowing political conduct. Political life over the last decade is characterised by a continual assault on democratic rights; if you doubt that, just ask Omar Khadr, or Moazzam Begg. Let’s stop this endless war funding, as Engelhardt explains. Anthony Arnove demonstrates that we in the western world have undergone a dramatic cultural shift, with the corporate-controlled media playing a huge role in promoting the war on terror hyperbole, legitimising the invasions and occupations of Iraq and Afghanistan, and nourishing the racist Islamophobic campaign, targeting Arabs and Muslims in general as a potential fifth column in subverting ‘western values’, and bolstering public approval for war. Let us campaign for an alternative world, without imperialist wars and occupations, racism and soaring corporate profits. Let us regain the basic democratic and social rights that we have lost because of this undemocratic war on terror, and mobilise against the financial aristocracy and war profiteers to save our planet. With this quote, Pope Benedict XVI thrust into the limelight not only the name of a previously obscure emperor, but also a long-neglected empire that had fought between the Islamic world, and the main Western Christian church, namely Roman Catholicism. That empire was Byzantium, and most people were asking – what is Byzantium? To answer that question, one should look no further than the marvelous book by Professor Judith Herrin called Byzantium: The surprising life of a medieval empire. I will address the Pope’s remarks a little later. The title of this article comes from one of the chapters in Herrin’s book – a grand duke and admiral of the Byzantine emperor had made the statement ‘better the Turkish turban than the papal tiara’ back in the 1440s to summarise the crossroads that Byzantine civilisation occupied and the foreign policy dilemmas that confronted the Byzantine political leadership. This popular proverb stands in stark contrast to the sentiments quoted by the Pope above. But what Herrin’s book accomplishes is a sweeping and detailed examination of Byzantine civilisation – its art, architecture, law, economy and politics. Quite a wide-ranging scope in one volume. Byzantium, the eastern half of the previously united Roman empire, grew from its ancient roots to become a cosmopolitan, medieval civilisation. The first portion of the book documents the transformation of what was the East Roman empire, with its new capital at Constantinople, into the sprawling inheritor of the Roman empire’s mantle, laws, paganism and traditions. But Byzantium then developed its own distinct Greek-speaking imprint on Roman customs, and its version of Orthodox Christianity. It is as a barrier against the spread of Islam that Byzantium is best-known. Apart from the stereotypes of exotic riches, endless political intrigues and interminable theological debates, Byzantium is recognised as the ‘eastern defender’ against Islamic armies. Indeed, Byzantium came close to being totally overrun by the Islamic Arab armies that came out of the Arabian plateau. The dual challenges of the Slavic peoples in the Balkans, and the Persian empire in the east, stretched the resources and fighting capacity of Byzantium to the limit. But Byzantium survived the Islamic challenge, and ‘rescued’ Europe from the seemingly invincible Islamic conquerors. Herrin states that if Byzantium had fallen, most of Europe would have been conquered by the Islamic forces. In one sense, today’s Europe was only able to survive because of the intercession of the Byzantines. It is this aspect of Byzantine history which the Pope and his supporters would like to enlist for their political agenda during this era of fractious relations between the West and the Islamic communities. But Byzantium was more than just a ‘bulwark against Islam’ – which is the title of one of Herrin’s chapters. Byzantium also had a complex cultural life, with pagan, pre-Christian texts and authors being incorporated into the framework of Byzantine culture and philosophy. Byzantium was an eastern orthodox empire, but with partly pagan features and origins. Byzantium was definitely and stridently a Christian empire, but it also was shaped by the ancient Greek authors, the Roman thinkers and pagan customs which influenced its society. The burning of incense, the veneration of images of gods, the celebration of Christian holidays based on pagan, pre-Christian holy days – these all attest to the complex melding of pagan and Christian elements. The translation of pagan philosophers into Greek, the active debate and commentaries about science, mathematics, whether the world was created has always existed – these debates reflect an active cultural life in Byzantium. While Byzantium fought to contain the Muslim armies, the empire can hardly be called a defender of Christianity. The great schism between Latin West Christendom and Easter Orthodox Christianity did not start with Byzantium, but it certainly worsened with the arrival of the Crusades. In the chapter ‘Fulcrum of the Crusades’, Herrin details how the Byzantines called upon their Latin Western Christian friends, namely the papacy and the west European Christians to help fend off the growing threat posed by the encroaching Seljuk Turkish empire. With this call, Byzantium and the Christian East opened up a cantankerous, fragile relationship military relationship with the Latin Christian West. While the object of the Crusades was to reconquer the holy lands from Muslim control, the relations between the Christian forces were marked by mutual suspicion and bitter recriminations. By the time of the Fourth Crusade, relations between the Latin crusaders and their Byzantine hosts had deteriorated so much that when the Byzantine side failed to fulfill the terms of their agreement, the crusaders abandoned their original objective of the holy lands and ransacked Constantinople itself. This mass sacking of Constantinople in 1204 not only poisoned relations between the eastern and western Christians, reinforcing the great schism between the Roman Catholic west and Eastern Orthodox East, but also reduced Byzantium to such a perilous state it was divided into a patchwork of Latin and Greek-speaking states. By April 1204, the greatest city in western Christendom was a mass of smouldering ruins, as Herrin states in her book. Anti-Latin sentiment ran high, and the prospects of recovery were bleak. Yet by the 1260s, Byzantium recovered somewhat, with one of the Greek-speaking successor states, Nicaea, managing to recover Constantinople, holding off the Seljuk Turks and reestablishing a distinctly Byzantine empire, though in truncated form. With all these military fluctuations, it is a wonder that the many architectural achievements of Byzantium have survived – in particular the church of Hagia Sophia. A whole chapter in Herrin’s book is devoted to the construction, engineering feats, and survival of the church, which became a mosque in 1453 with the arrival of the Ottoman Turks, and is today preserved as a museum. The scale of Hagia Sophia and its impressive dome suggests engineering skills that are exceptional. Most of the early Christian churches followed the template of a basilica, so to construct a dome was quite novel and daring for Byzantine times. The Hagia Sophia, as constructed by the emperor Justinian, has survived arson, riots and earthquakes throughout the years. There is so much more to digest in Herrin’s book; I hope I have done justice to its contents with this short review. Byzantium persisted for another 250-odd years after the Fourth crusade. Herrin looks at the frequent challenges Byzantium had to face – wars with the Bulgarians, the transformation of an ancient economy into a medieval one, the continued toleration of a cosmopolitan society that included Jews, Varangians – Armenians found employment in the Byzantine armed forces. But one challenge proved overwhelming – the Ottoman Turks, who expanded from the Anatolian peninsula and finally conquered Constantinople in 1453. The Byzantine empire was a complex, multifaceted state, with its own combination of Roman traditions and Christian practices. This brings me back to the Pope’s earlier quotation about Islam taken from Manuel II. Why did he choose to make this statement, rather than elaborate on all the scientific and cultural achievements of the Byzantines? I think the Pope’s use of that quotation was more than just misleading, as Herrin correctly notes. It poured petrol on an existing fire – the tension relationship between Islamic communities and the European West. I think Pope Benedict XVI promoted a stereotypical view of the Islamic world as uniquely irrational and incapable of rational change. Herrin’s volume goes a long way towards demolishing the highly inaccurate stereotypes about Byzantium as a tyrannical regime run by corrupt, effeminate cowardly men. We would do well to reexamine our own myths and stereotypes, rather than point an accusatory finger at other civilisations. Read Herin’s book if for no other reason than this one – Byzantium is absolutely fascinating.